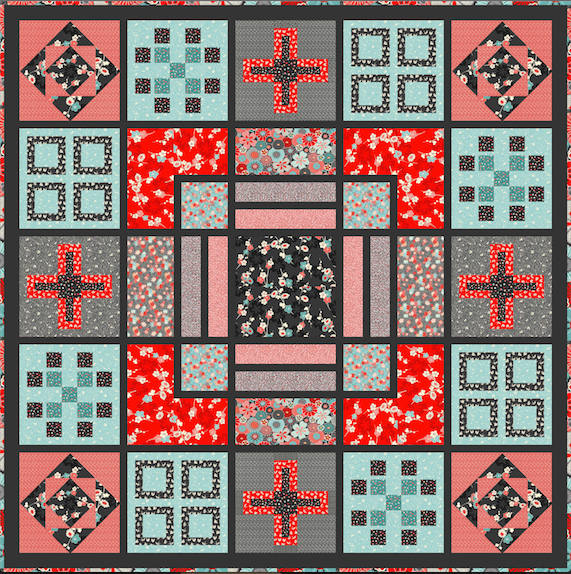 A while back Makower sent me the images for their new Japanese line Sakura to design and make a quilt the pattern for which is then available as a free download from their website. Makower and I went back and forth for a while over this design. I wanted some traditional feel, simple bold blocks around the outside of the quilt but wanted room in the centre to showcase some of the beautiful large scale prints in the line. The image below was drawn up using a beta version of Touchdraw for mac which has the ability to auto-fill using jpegs - i.e. fabric images can be dropped into the quilt design. Makower and I were really happy with the finished quilt and felt that the work taken at the design stage had really paid off to make quite a striking quilt. I also get a kick - I don't know why - out of the final quilt looking the same as the image I had drawn up. I used a black Aurifil 50wt this time to quilt a diagonal cross hatch so the thread hides itself on the black frame sections of the quilt. This quilt design will soon be available as a free download on the Makower website and I'd love to see your version if you make it. Lynne! This is so lovely - the black border with the patterned binding is an especially nice touch, I think. Such a clever girl and, yes, your sympathetic design really shows off those centre fabrics! I love the combination of the centre 'showing off' section and the border formed from blocks - very clever! This is beautiful!! I hope you give us a heads up when the pattern becomes available. I hope they use this in their ad campaigns! i'd love to see it in magazines :) Yay!! really love this quilt - the colours and design are fabulous !! What a beautiful quilt design - it really shows that you designed it to featured the fabrics. Love the quilt , stunning !